So we open the final ‘window’ in our social history book advent calendar. 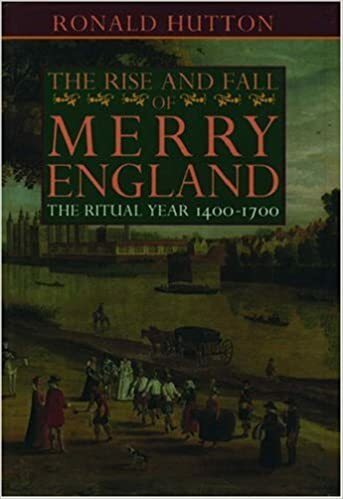 Given that this time of year is stuffed full of ritual and tradition, it seemed fitting to save Ronald Hutton’s The Rise and Fall of Merry England: the ritual year 1400-1700 for today. Professor Hutton looks at a range of customs and traditions, both religious and secular in origin. Highdays and Holydays (sic) marked the seasons for our ancestors, providing injections of excitement into routine lives. Some of these were national rituals, others more localised and Hutton has sought out references in contemporary documents that shed light on what was going on in particular towns. There is an appendix listing the churchwardens’ accounts that Hutton used in his research; the coverage is prodigious. In the pages of this book we find out about Maypoles and mummers, Candlemas and church ales and everything else in between. Hutton admits that, at times, the evidence is fragmentary but he has produced a comprehensive account of the celebrations of the early modern period. The time span covered by this book saw more than one major event that served to dislocate our ideas of celebration. The tumult of both the Reformation and the Civil War meant that our rituals in 1700 were very different from those of 1400. As I come to the end of this year’s ‘calendar’, I would like to encourage you to review books that you read. It is the season of giving and it is the greatest gift you can give an author, well apart from buying their books in the first place. Obviously it is lovely if they are 4 or 5 star reviews but they do need to be genuine reactions. I personally don’t review at all unless I can award a ‘good’ rating. Reviews do not have to be lengthy. If you feel you can write something more than ‘great book’, it is helpful but all the authors I know would be grateful for two word reviews. I know I don’t write enough reviews and I really should. There’s a New Year’s Resolution in there somewhere! Can you commit to writing one a week, one a month or one for every book you finish in 2018? Use whatever medium suits you, Amazon, Goodreads, Twitter or a blog but make an author happy. It just leaves me to wish everyone a Happy Christmas and a new year in which we celebrate friendship and are tolerant of difference. We are moving closer to the present day with Tom Harrisson’s Living through the Blitz. This book is based on the contemporary diaries and returns that formed part of the Mass Observation Survey and goes behind the ‘stiff upper lip’ media propaganda. Here you will find unvarnished, hard-hitting stories of fear and panic; accounts that are very different from nostalgic reminiscences, written long after the time. Inevitably, a significant proportion of the book concentrates on London but there are also chapters on the Southern ports and the industrial north. I particularly like the individual, personal experiences that shine out from the pages of this book. If the Blitz is history for you, rather than memory, you may well find that your preconceived ideas of keeping calm and carrying on are overturned by reading Harrisson’s work. More information about the Mass Observation can be found here. The original records are held by the University of Sussex. I am still suffering from post-shed moving related injuries. Aided by adrenalin, yesterday I managed to steady sides of a shed as my companion devised a method of rolling the panels along on random bits of pipe. At least it is now ‘job done’ and I have a perfect excuse for not scrubbing floors (or indeed moving) for the next few days. I also have confirmation that the job I must not mention will see me take on a different role next year. I have a sparkly new job title and am now, in theory, less unimportant. As a result, I will be immersing myself in the world of Restoration Britain, slightly later in the seventeenth century than my usual stomping ground but I am relishing the challenge. Did someone mention ‘slowing down’? I’ll be honest, today’s offering has just arrived on my book shelf, so I have only had time to skim through it but it looks like a gem. 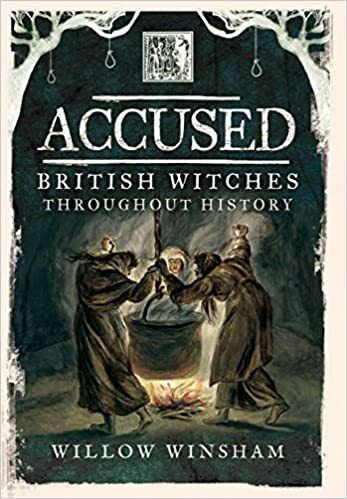 Accused: British witches throughout history, by the prosaically names Willow Winsham, is a little more ‘niche’ than some of my advent book choices. It is not the comprehensive study that the title might suggest but don’t let that put you off. Here we have eleven case studies from across the British Isles. Although most are seventeenth century accusations, the date span is 1324-1944. Through the stories of these women and these examples are all female, the author helps us to understand how individuals came to be the accuser or the accused and tells us of their lives before and in some cases, after, the indictment. At first, I felt that the very brief introduction was inadequate but Winsham’s aim was not to write yet another general study; there are a number of excellent ones already. If you regard this as a companion volume, that tackles the topic rather differently, then it can be viewed as an excellent book. Yes, we learn a great deal about the context through the stories if these eleven women but serious students of the historical witchcraft will need other books to get a fuller understanding of the background and the psychology behind this phenomenon. This is not a criticism of Accused, whose fresh approach adds a new dimension to our understanding. The author has used broadsheets, court reports and other contemporary sources to help us understand how human beings could revile their fellow men, or in this case women, in such an impassioned manner. The book includes extensive end notes, clear black and white illustrations and a bibliography. Sadly, human nature does not change and although we might be unlikely to accuse our neighbours of witchcraft in twenty first century Britain, other forms of bullying and succumbing to peer pressure haunt our everyday lives. I am fascinated by people’s behaviour and what makes them act in a certain way. I am also keen on women’s history and the seventeenth century. With this combination, how could I not be interested in witchcraft history? I researched the topic carefully when I was writing Coffers, Clysters, Comfrey and Coifs: the lives of our seventeenth century ancestors, which contains a chapter on witchcraft. The topic also forms one of our Swords and Spindles presentations and my own The Burning Time talk about historic witchcraft is one of my favourites to deliver. Living as I do within a few miles of the home of the last (probably) three witches to be hanged in England how can I not be fascinated? And yes, I will come clean, there is a tenacious nagging idea for a second novel in here somewhere. I really need to suppress this until Barefoot is finished but I suspect that it won’t go away! No writing accomplished yesterday sadly. I was diverted just as I was about to put fingers to keyboard, a process which is usually preceded by re-reading, for the umpteenth time, part of what I have already written. I always read aloud as this slows me down to an acceptable level and I was just declaiming my flowery phrases to an audience that consisted of a Christmas tree, when I was called upon to assist the fisherman of my acquaintance. He is currently moonlighting as the gardener of my acquaintance. Pressures of time mean that we are giving up the allotment. I say ‘we’; it is officially my allotment but all the hard work has been delegated to said gardener/fisherman. The incoming tenant did not want the shed so this week’s task is to relocate a eight foot by ten foot shed to my garden. In a method that does not bear imagining, the shed assumed flat pack mode and single-handedly the gardener, now in his eighth decade, managed to get this on to a trailer and up my drive. Then it was my turn to help bring the panels in to the garden. I promise I was lifting when instructed so to do but I have to say there was not much sign of my end of the structure leaving the ground. Somehow we struggled down the path and negotiated over hanging trees and the washing line in order to bring three panels into the garden before my back clicked in protest. I have no idea how we are going to get the remaining four panels in today. Again this is the royal we, my protesting back means that I can barely put my socks on let alone attempt shed lifting. These occasions make you realise that you lack fit, healthy, dare I say younger, friends. If anyone is still reading these, congratulations and I refuse to be responsible if you have succumbed to my suggestions and blown your book buying budget. 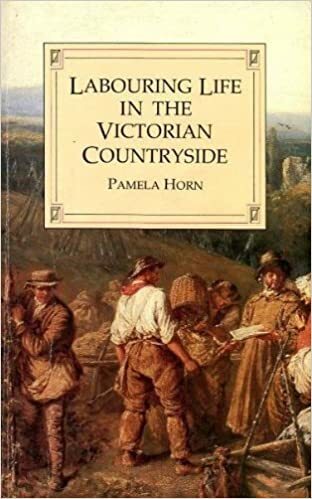 Today I would like to introduce you to Pamela Horn’s Labouring Life in the Victorian Countryside. I have had the pleasure of hearing Pamela Horn speak. In fact, on one memorable and somewhat embarrassing occasion, her 35mm slides slowly melted in the projector we had provided (you can tell this was some time ago!). Her social history books are all valuable reading for anyone trying to understand life in the Victorian era. The clue to the content of this particular volume is in the title and this is an excellent general introduction. The book covers many aspects of rural life in the nineteenth century. Here we can learn about home life, education, religion, leisure and cottage industries. There is a chapter covering the impact of trade unionism and another about crime and punishment. Other chapters look at poverty and at medical care. I particularly like the author’s habit of using named individuals as examples. The fruits of her extensive research in contemporary sources are shared with her readers. My paperback edition has a few, rather dark, black and white photographs by way of illustrations, which don’t really add anything to the text. The appendices include details of labouring budgets and wages and a contemporary accounts of labouring life. There is also a useful bibliography, as well as end notes. It is another very useful book for those looking for context for the lives of their ancestors. There was not much progress on Barefoot on the Cobbles yesterday. I am still bogged down with the tricky inquest scene. I took time out to write the next in my series of articles for the In-depth Genealogist Magazine (IDG). My column is about the lives of our female ancestors and this contribution was to be about suffragettes. I rashly included this when I was working on the suffragette chapter of Barefoot but suddenly this seemed like a less than good idea. IDG has an international readership and I needed to take that in to account and actually, once I got started, I really enjoyed researching it and I am now wishing I had time to take this further. I don’t have time. I really don’t. Please keep reminding me of this. I will pass on one gem that I gleaned. There is an online list of suffragists who signed a petition to parliament in 1866. I don’t want to give too much of the article away but there are similar lists of signatories to later petitions in Australia and New Zealand that a whiz of your preferred search engine should lead you to. Was great great granny a suffragette? I am wondering how much of my newly found knowledge I can impart to students of my forthcoming online Discovering Your British Family and Local Community in the early 20th Century course. You know the course, I believe I have mentioned it before and I expect, if there are still spaces, I will mention it again. It would be a great boost to your research as 2018 dawns. I could not compile a list of social history books and omit the ‘Farm’ series. They have already warranted a couple of passing references in other posts but today’s belongs solely to them. Many people, especially in Britain, are family with BBC TV’s living history series Victorian Farm/Edwardian Farm/Tudor Monastery Farm/Wartime Farm. All of these are now available on DVD and are a wonderful insight into rural life in the period specified. What is less well known is that each series also has an accompanying book; I have them all. These are ‘coffee table’ books: beautifully produced hardbacks with lavish coloured illustrations. There are contemporary illustrations as well as scenes from the programme. I have no idea how well this translates to the e-reader editions. The books are nonetheless well researched and the insight into the experimental archaeology carried out by the authors, Peter Ginn, Ruth Goodman and Alex Langlands, is invaluable. 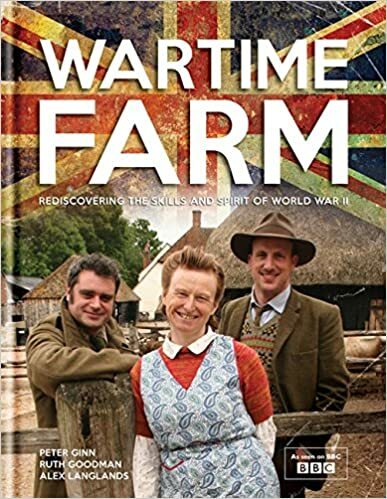 For those who are unfamiliar with the series, three historians/archaeologists spent a year recreating life in a farm of a particular period. The books describe the highs and lows of their experiences. I have decided to focus on Wartime Farm. 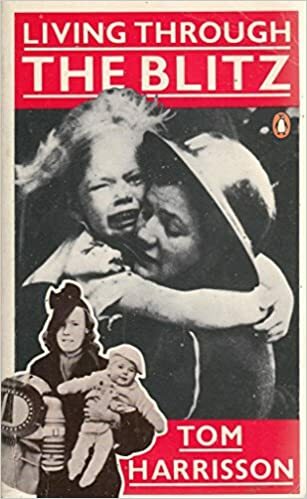 The war referred to in the title is the Second World War, so this volume features the struggle to increase production during the conflict and the on-going tussles with officialdom, in the shape of the ‘War-Ag’. The book goes beyond the difficulties of the small-scale mixed farmer to describe the role of the farmer’s wife, giving and added female perspective. There are sections devoted to rationing, machinery, evacuees, home defence, labour, digging for victory and making do and mending, along with many others. The book does talk about the making of the series and this aspect may be less relevant to some. There are however ‘how to’ sections; so between the pages you will find a recipe for plum duff, instructions for making a mop, details of how to dance the foxtrot and how to make shampoo. In summary then, a good, general introduction to life on the wartime farm, well written and beautifully produced. Insider tip – there was a low-key, forerunner to these programmes, Tales from the Green Valley, focusing on the seventeenth century. I think this is the best of the lot. There is no book for this one but you can still get it on DVD, either as a stand alone or, at very little extra cost, as a companion with Victorian Farm and yes, I have that too. 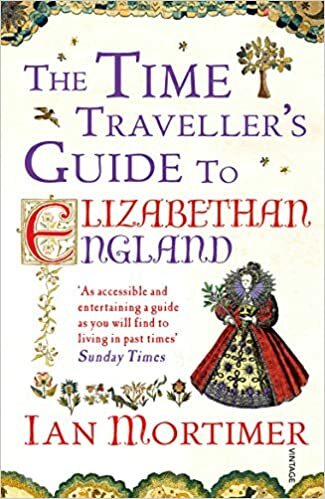 Another favourite pops out from behind today’s advent window, Ian Mortimer’s Time Traveller’s Guide to Elizabethan England. In a similar vein to Ruth Goodman’s How to be a Tudor, this guide takes you back, to explore ordinary life in the sixteenth century. Here are the sights and smells of Elizabethan England in all their raw glory. We learn what to wear, what to eat and how to keep healthy. There are hints on avoiding committing a faux pas in this religiously turbulent age, along with valuable advice on manners and travelling by road. We are regaled with likely punishments should we, the visitor, transgress in some way. Being a country bumpkin, I might have wished for a slightly greater emphasis on rural life but this is a very minor point. There are coloured plates in the book but I did feel a bibliography would have been useful, even though there are many sources mentioned in the detailed notes. As an inveterate note reader I do find endnotes irritating and I am assuming that this would be even more tricky on an e-reader. To me, readers either look at notes or they don’t and if they do, flicking back and forth is a pain, even though it does allow me to utilise two book marks! Footnotes rule – ban endnotes! This is yet another volume that demonstrates the fact that well researched history does not have to be boring. I enjoyed the time-traveller format. I do of course actually travel to the sixteenth century on a not infrequent basis. Next time I will take this as a guide. I once had to do a seventeenth century presentation in front of Ian Mortimer – that was daunting, all I can say is that he didn’t walk out! I have chosen this particular book but there are similar volumes on Medieval England and Restoration Britain by the same author. His books, along with many others, feature on our website’s list of books about the sixteenth and seventeenth century.